Not for profit or not? 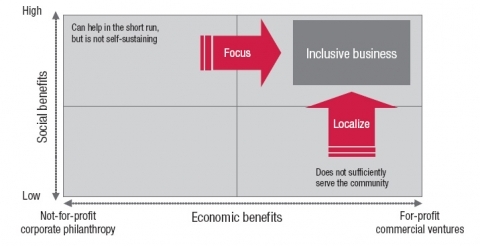 An inclusive business as defined by Wikipedia is a commercially viable model that benefits low-income communities by including them in a company’s value chain on the demand side as clients and consumers, and/or on the supply side as producers, entrepreneurs or employees in a sustainable way. Inclusive business is not corporate philanthropy or corporate social responsibility, which have inherent limitations of scope, impact and budget. Rather, it is the search for sustainable business models that “do well by doing good” and are part of the companies’ core business activities – the key to business having development impact at scale. Yawama of Sweden is a for profit business that aims to do well by doing good, although profit maximization is NOT our ultimate goal. The current focus is to meet current expenses which include developing products and the producers, training and testing expenses and meeting Yawama administrative costs. I do get questioned about my business model some people feeling that I would be better off running my business as a charity. Swedes are happy givers towards philanthropical initiatives and businesses can make beneficial tax reductions on goodwill. Not for profit organisations are a large part of the business community. My personal opinion is that building fundraising into your business concept can be costly and time-consuming and requires a large network and may not be the most cost-effective tool for a smaller business and might not provide incentives for creative and practical solutions for businesses to run. Individuella Männsikohjälpen (IM) in Sweden have existed for many years running as a not for profit organisation successfully importing crafts from developing countries but also working with development and aid. They have a large network of producers, employees and volunteers. IM products include fair trade coffee, teas and home interior and textiles. Sackeus is a good example of a business that started out as a not for profit being run by the Swedish Church, and today run as a large wholesaler of fairtrade coffee, tea and confectionary. Both the above examples are predominantly importing from South America and Asia and are established larger organisations. North and South Fair trade and The house of Fair Trade are large wholesalers of imported goods from many developing countries. They stock food and beverage and a range of interior accessories. The house of fair trade also stocks children articles. African touch, Just Africa and Afroart , are physical boutiques based in Stockholm all supporting small-scale producers in Africa ( although afroart works primarily with producers in South America and Asia. Afroart started out as a not for profit today operates as a for profit business with design playing a large part in the productions process. I intend to discuss design processes later. All the above just like Yawama of Sweden promote fair or ethical trade and market their products as products that improve livelihoods by job creation or increased incomes or “trade not aid or “help to self-help”. I will discuss definitions and certifications in upcoming chapters because this is a science on its own. All the above companies have Webb based sales (apart from African touch) as a compliment to their wholesale or retail activity. This entry was posted in Import Guide and tagged Africa, import, inclusive business model, NGOs, not for profit by NICKY. Bookmark the permalink.